Exterior house wash is accomplished through the use of biodegradable chemicals and low pressure. Driveways, sidewalks and patio's are also cleaned using biodegradable chemicals, hot water and high pressure. Gutter cleaning with biodegradable cleaners and low to mid pressure. Wood cleaning and staining (optional) includes: fences, arbors, pergolas, and decks - accomplished with various biodegradable chemicals and always with low pressure and	No Hot Water! Hot water damages wood! Staining is optional, and highly recommended. If wood is not stained/sealed after being cleaned it will again, become gray and weathered. The staining/sealing process helps protect wood from the natural elements and provides a beautiful color to enjoy. 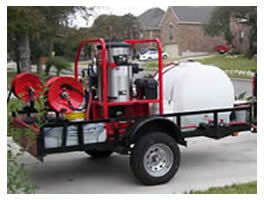 Call us at 210-887-2003 for your residential pressure washing needs.